Slow is the word for fishing right now. The fish are scattered all over with a few being taken early morning. Try running spoons off the downriggers from top to bottom. Dodgers with spin and glows close to the bottom for Lake Trout, start in 80 foot of water and work your way out to deeper areas straight out and North of the harbor. 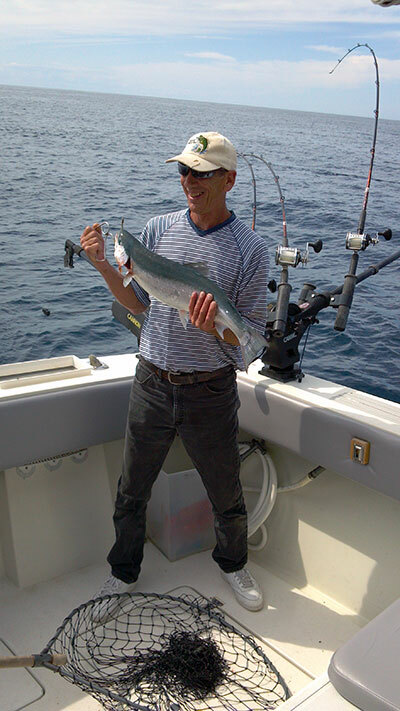 Try for Steelhead in the same areas running bright colored spoons off the Offshore boards using some 2,3,5,7,and 10 colored lead lines. Walleye continue to be scattered as well but the water temperature is finally starting to warm up, so they should start picking up on the bite. Try some small spoons and hot and tots, small spoons or crawler harnesses. Try for Bass in close to shore casting small body baits and spoons.